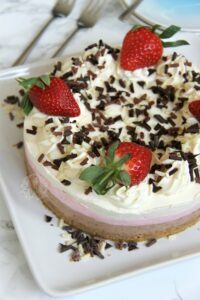 A Buttery Biscuit Base, Chocolate Layer, Strawberry Layer, Vanilla Layer, freshly whipped cream, Strawberries, and Chocolate Curls make a show stopping Neapolitan Cheesecake. I often get a bit stuck for knowing what to make next on my blog. I often ask for suggestions, which anyone who is reading this is welcome to do in the comments below, so that I can be inspired again. One thing that that has come up time again is a Neapolitan themed treat. I have a Neapolitan Cake & Cupcakes coming soon, but I wanted to start with something a little different. the Neapolitan Cheesecake. I had searched through Pinterest for these, and I hadn’t come across many. 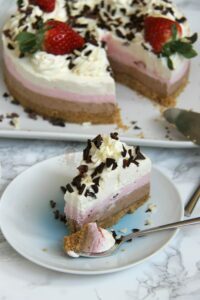 There’s many Neapolitan themed treats, and obviously cakes are one of the major players in the category, but only a handful of Cheesecakes. After the success of my No-Bake Triple Chocolate Cheesecake, I thought I would base this new treat on that. The layers on this one don’t look as satisfying as my No-Bake Triple Chocolate Cheesecake, because I was in a a bit of a rush when I made this one (I had 20 minutes to make and leave the house!) but I am still pretty content with how it came out. The mixture of flavours is an absolute dream. I love the combination, and I did as a child through the Ice-Cream I used to have. I will admit however that I used to avoid the Strawberry section as I was a chocolate lover as a child. I now however understand that the three flavours together are an absolute dream! I realise that this is a bit of a faff to make in comparison to my other cheesecakes such as my No-Bake Caramac Cheesecake, but it is SO worth it if you like Vanilla, Strawberry and Chocolate flavours. Honestly, I am surprised by how much I liked this one. 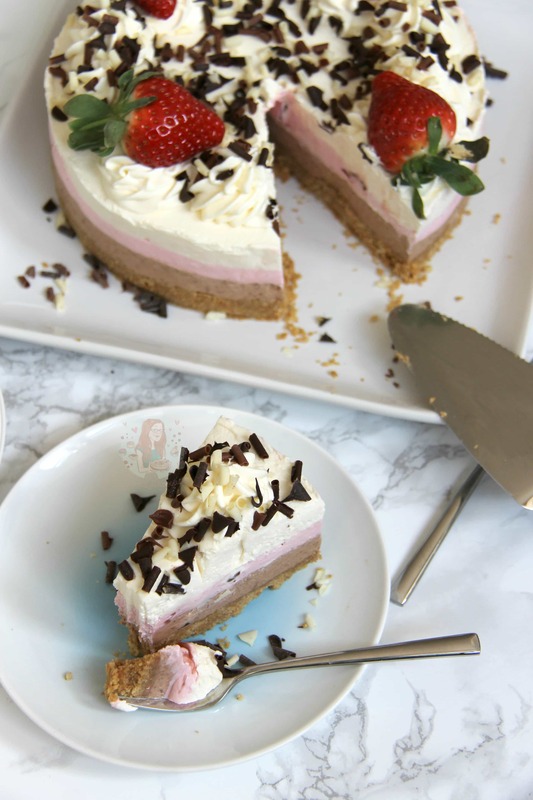 The little bit of sweetened cream on the top, the crunch of the chocolate curls, and if you’re lucky a fresh strawberry along with the cheesecake is so utterly delicious I can’t cope. 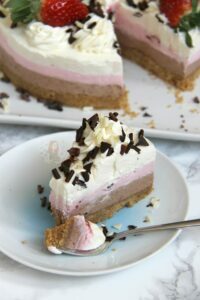 I hope you guys like this recipe, and look forward to more Neapolitan treats in the future! Enjoy! Melt the Milk Chocolate in a small bowl in the microwave microwave on short bursts until fully melted – leave to cool slightly whilst doing the rest. With an electric mixer (I used my KitchenAid) Whisk the Cream Cheese and Icing sugar until combined – pour in the liquid double cream and continue to Whip the Cream Cheese/Cream Mixture until it is starting to thicken a lot like a Mousse does (I use speed 6/10 on my KitchenAid). Separate the mixture between three large bowls (try to be as even as possible, I weighed mine) and pour in the melted chocolate into one of them. Fold the mixture together until smooth, and then spread onto the cheesecake base. In the Second Bowl, add in the Strawberry Jam and Pink Food Colouring and mix till combined and smooth. Spread on top of the Chocolate Layer. In the final bowl, add in the Vanilla Extract and mix till combined. Add on top of the Strawberry Layer. Cover the cheesecake and chill in the fridge for at least 5-6 hours hours or preferably overnight to set fully. 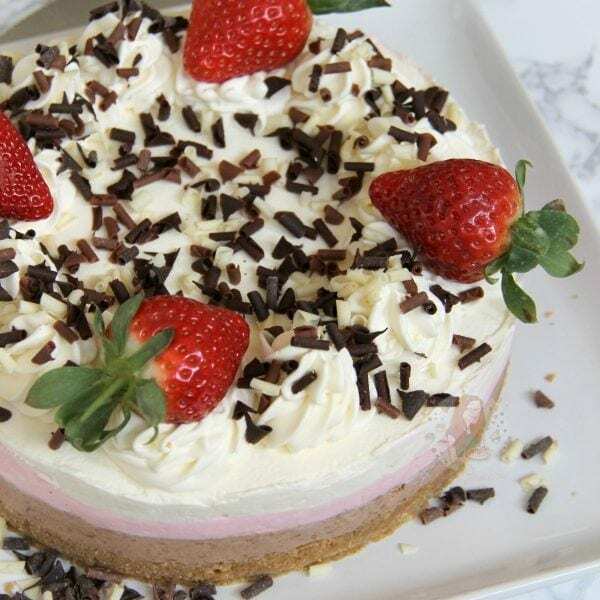 Remove the cheesecake from the tin, and then decorate with some whipped cream (Whip the 150ml Double Cream with the 50g Icing Sugar) and pipe on, some triple chocolate curls, or grated chocolate and some Fresh Strawberries and ENJOY! I used Milk Chocolate in my Cheesecake because its my favourite to use in a Cheesecake. If you find the coldness of the mixture seizes the chocolate and makes little chocolate lumps then it’ll still be fine to eat but it just doesn’t look as nice. However, you can add in more melted chocolate thats fresh from melting (So quite warm) and mix that through and it’ll smooth it out. 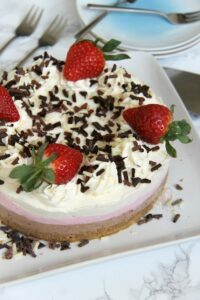 You can use Fresh Strawberries in the Strawberry layer like in my No-Bake Eton Mess Cheesecake, but as its not Strawberry Season yet, and strawberries can be unreliable in taste, Jam works just as well. 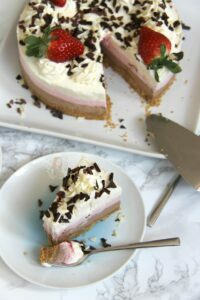 You can use gelatine to help it set if you wish, but for me you don’t need it if this cheesecake is made correctly, as seen in the pictures! 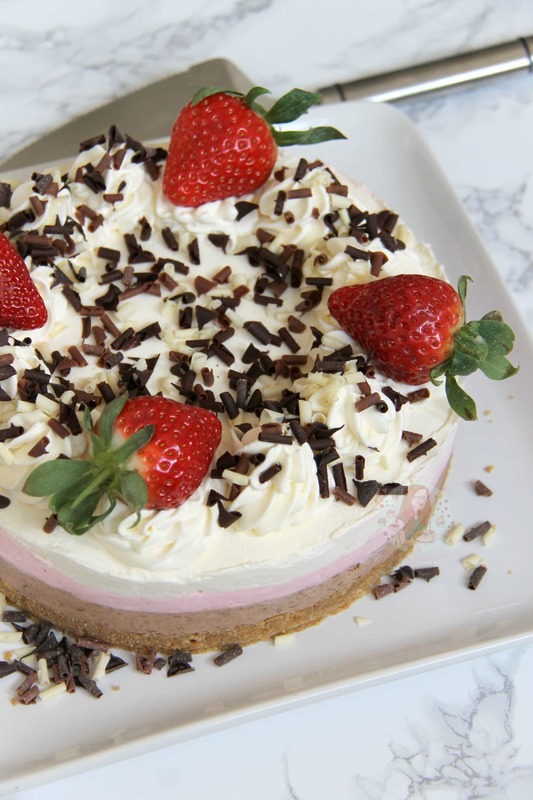 Find my other Cheesecake & Dessert Recipes on my Recipes Page! Older Next post: Caramac Rocky Road! Newer Previous post: Millionaires Brownies! Great recipe with so much flavour. Chocolate and strawberry (or Raspberry) always go well together. My suggestion is to make something ‘different’ with meringue or macaroons.(Fr. macarons I dont see a lot of variations with meringue. An all time favorite of mine!